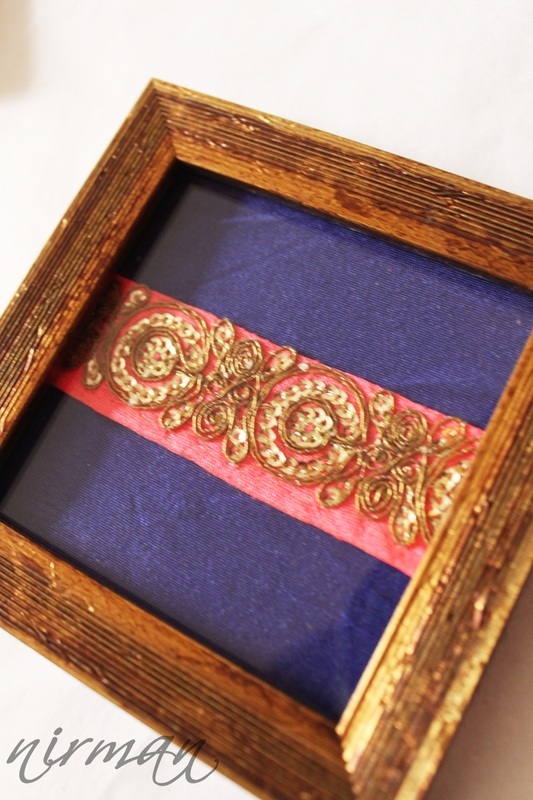 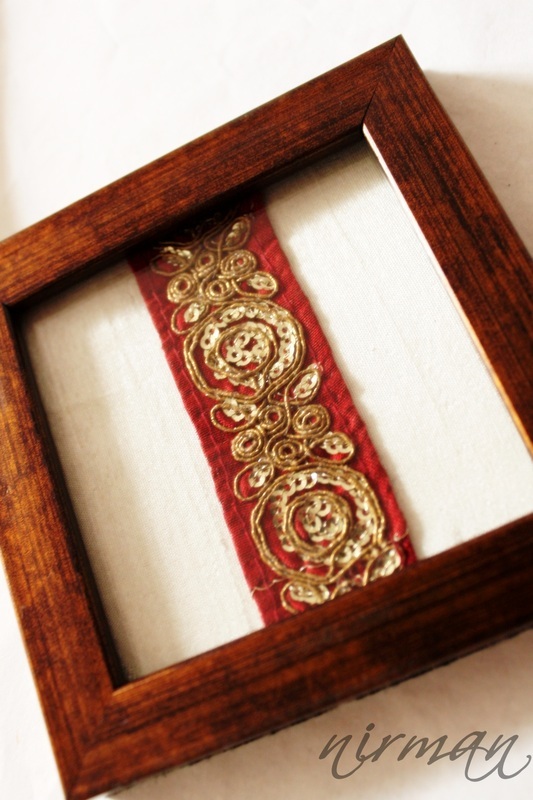 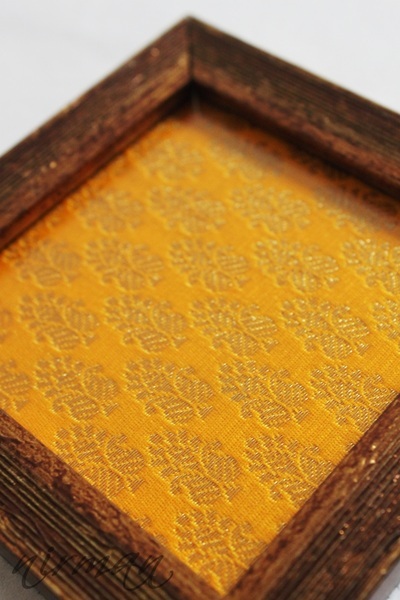 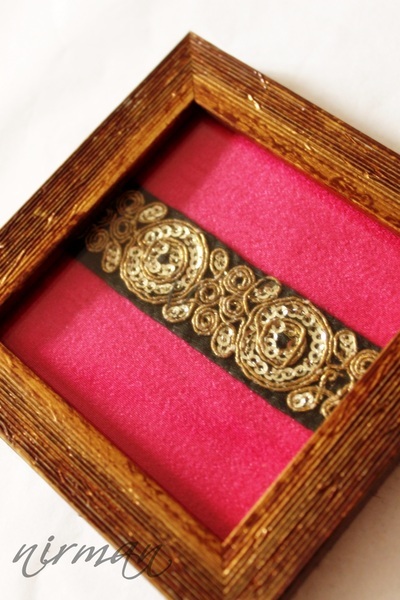 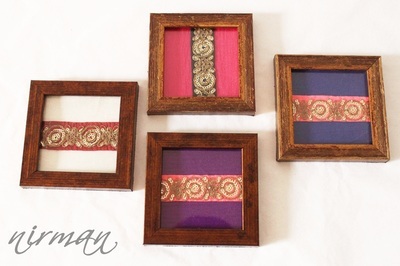 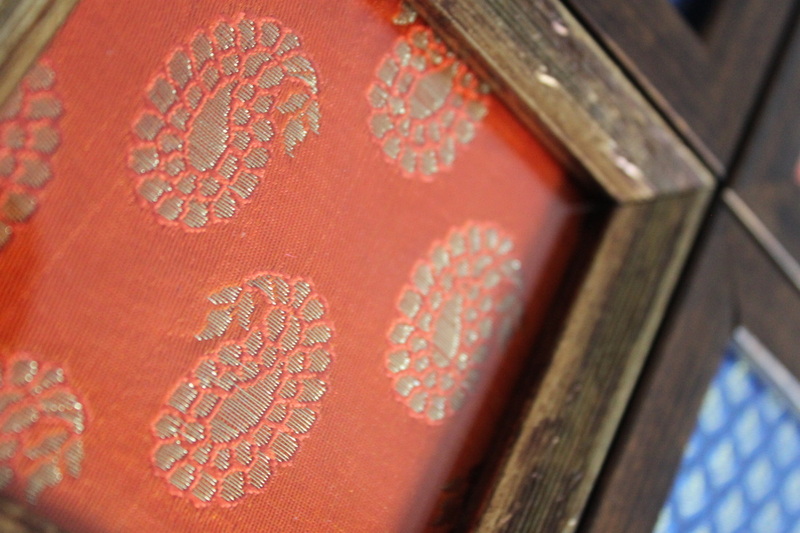 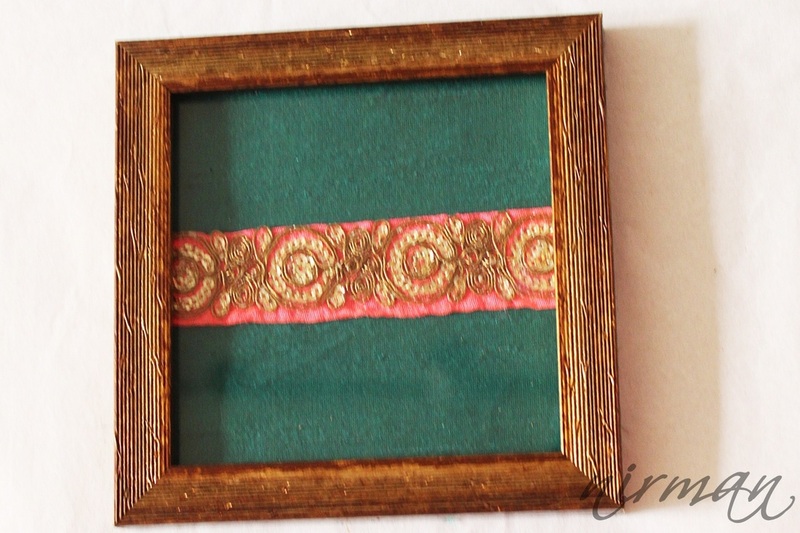 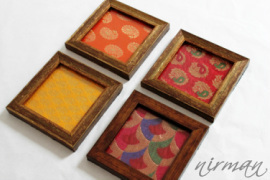 Fabric frames using rich Indian brocades, silk with trims and laces can be used as wall art or even coasters. 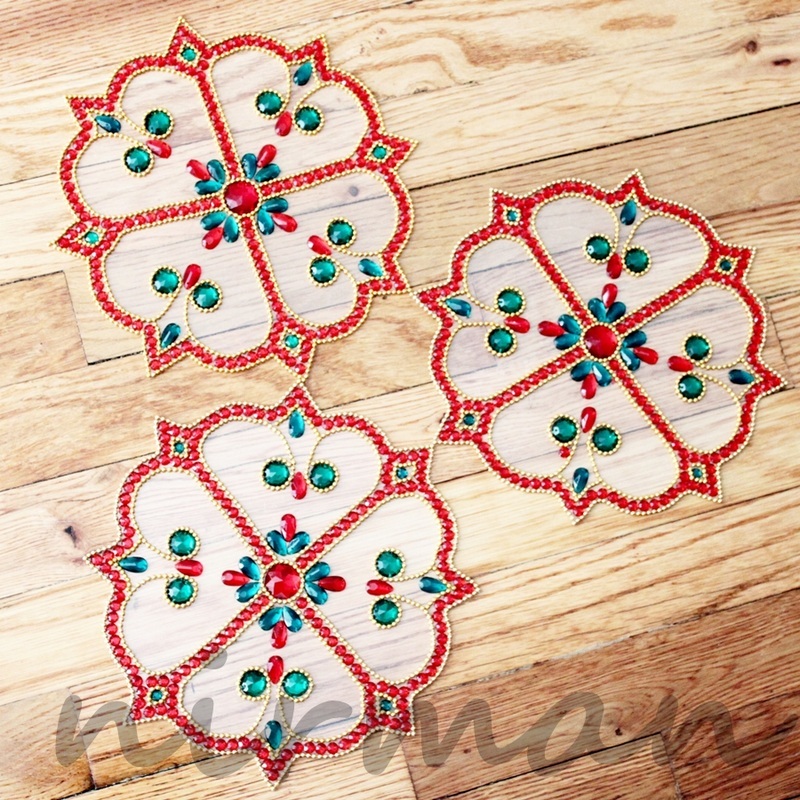 These pieces are conversation starters at any party or over a tea cup with your friends. 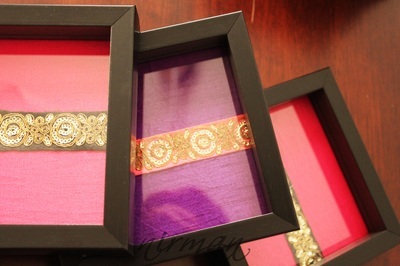 They are perfect hostess gifts or favors for any event. 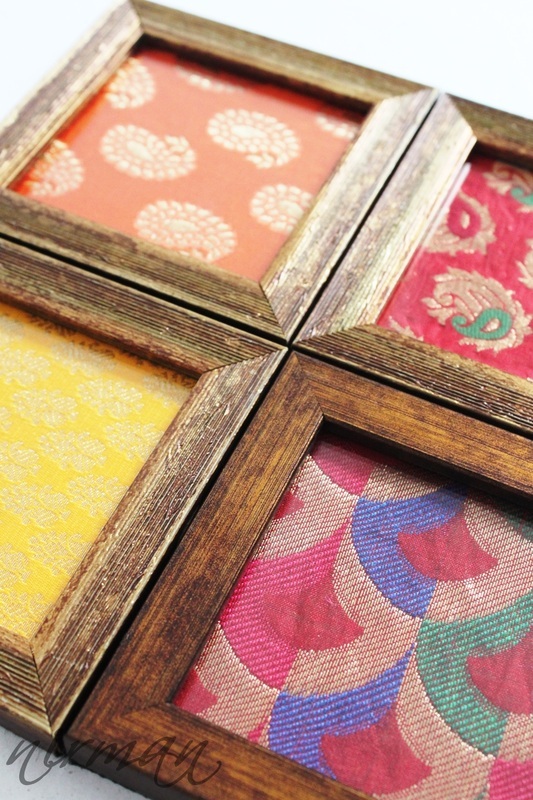 Celebrate with these pretty rich frames. 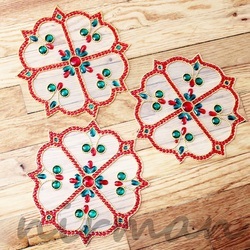 Many different ready to use designs and colors are available. 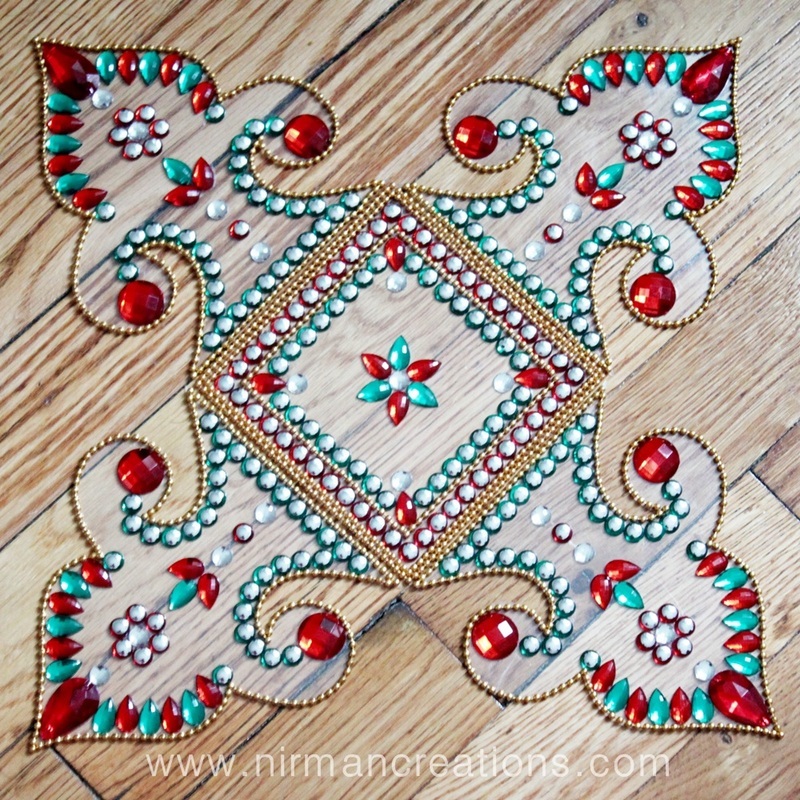 For custom colors and designs write to us. 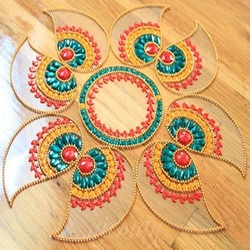 We accept PayPal & Direct bank deposits for all our order. 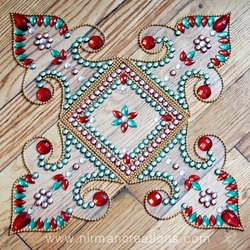 Rangoli is a traditional decorative folk art of India. 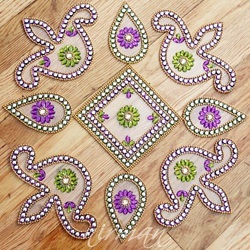 These are decorative designs made on floors of living rooms and courtyards during Hindu festivals and are meant as sacred welcoming areas for the Hindu deities. 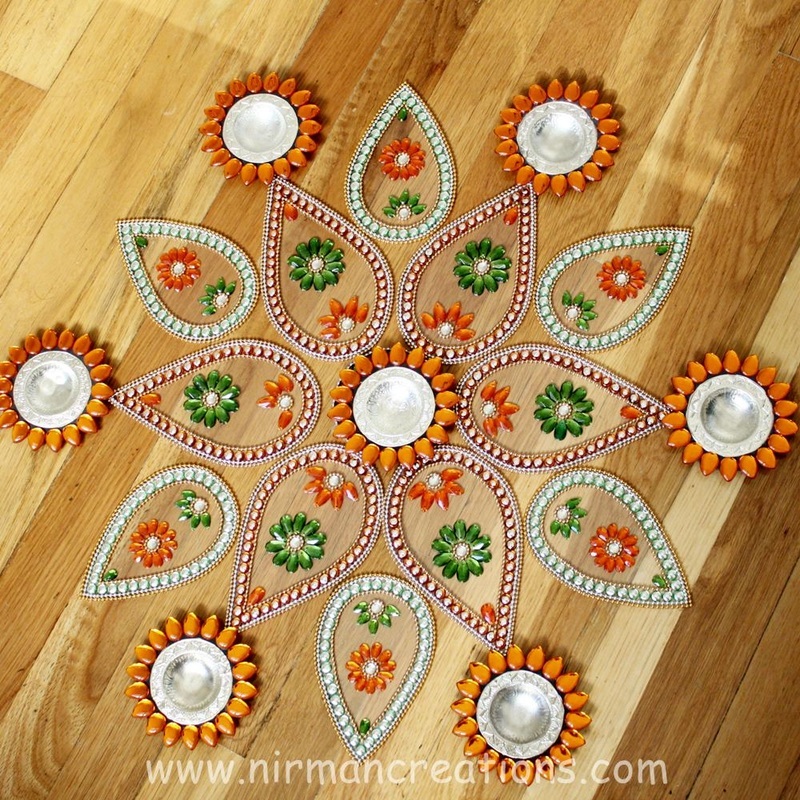 Rangoli is also know as Kolam, Madanae, Chowkpurna, Alpana, Aripana and many more names in various parts of India. 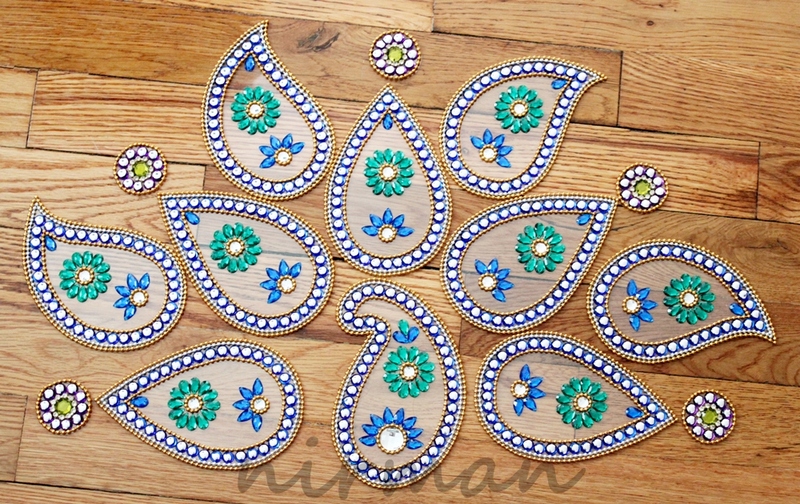 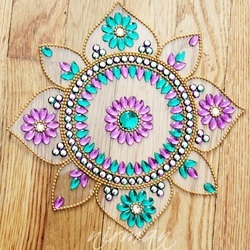 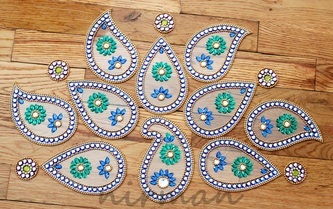 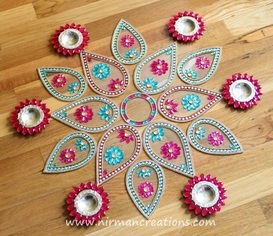 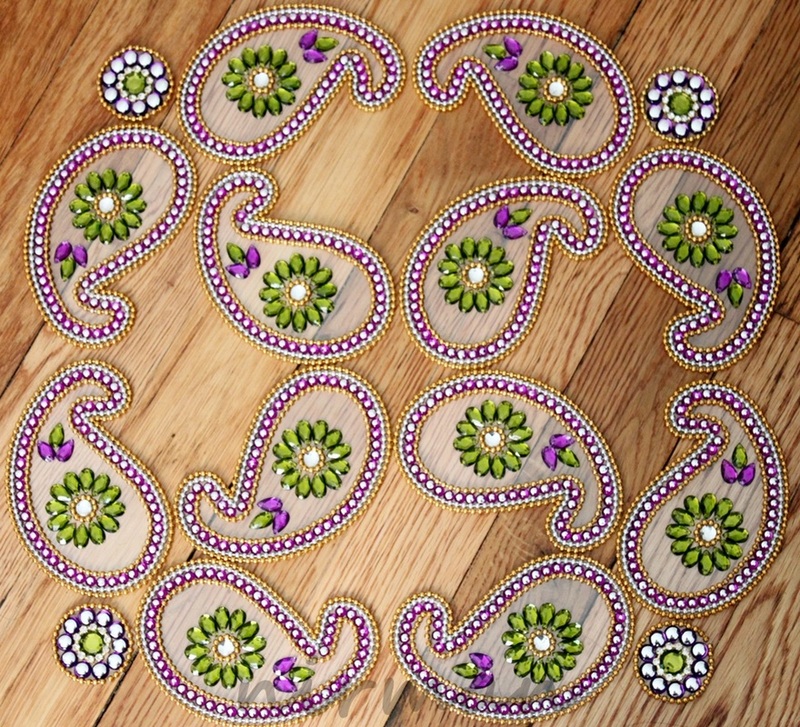 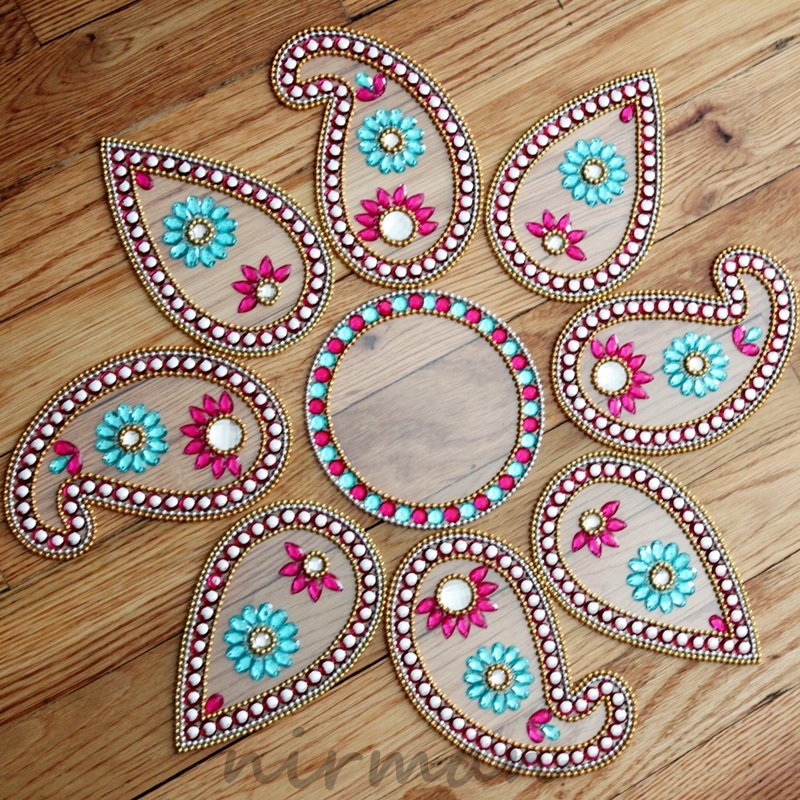 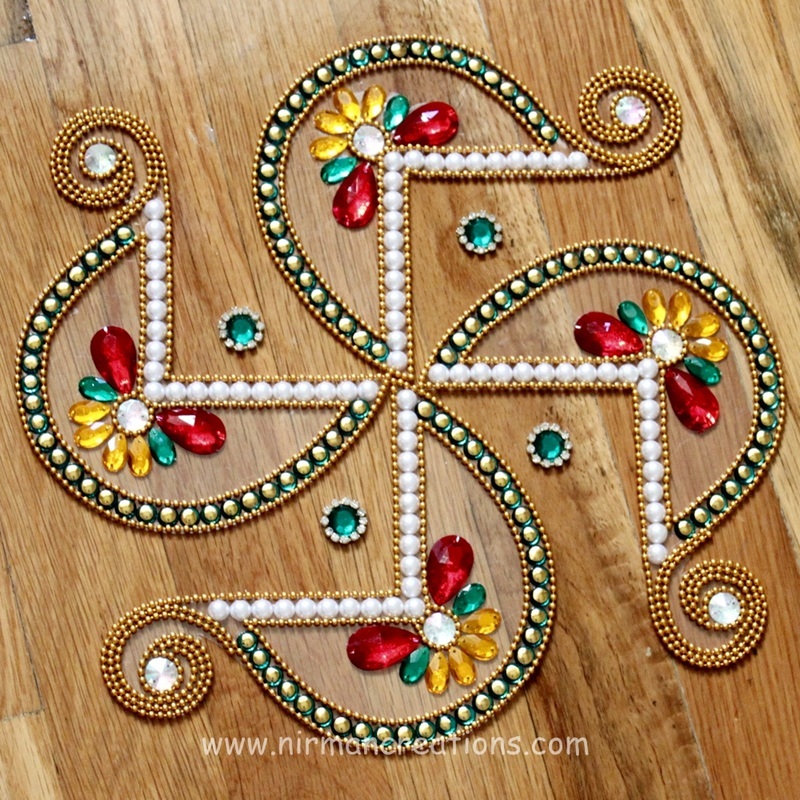 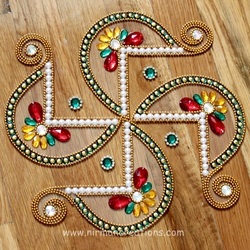 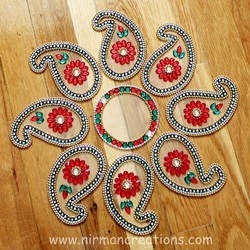 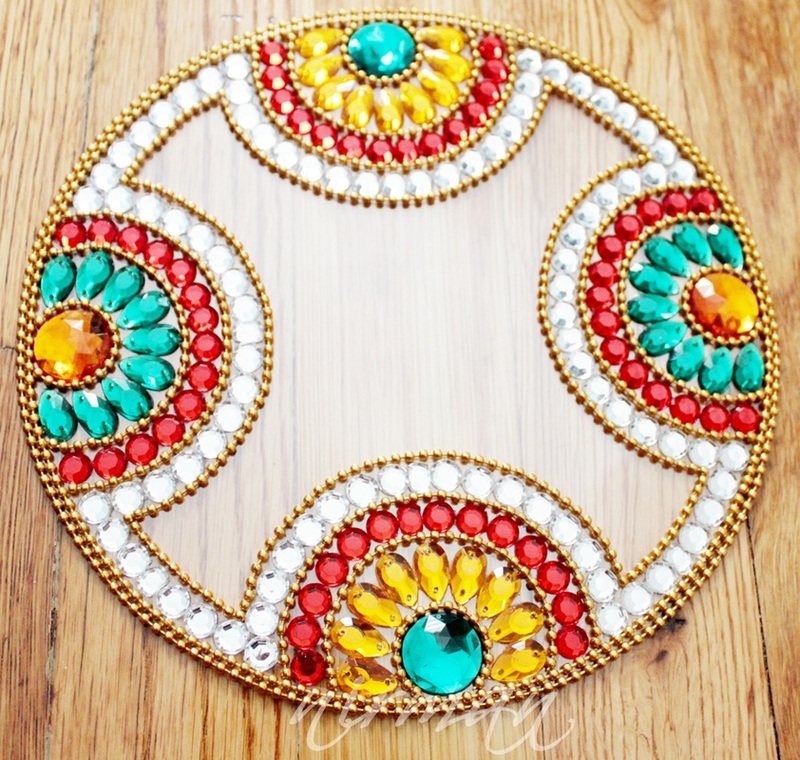 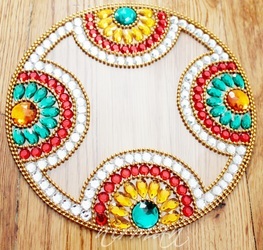 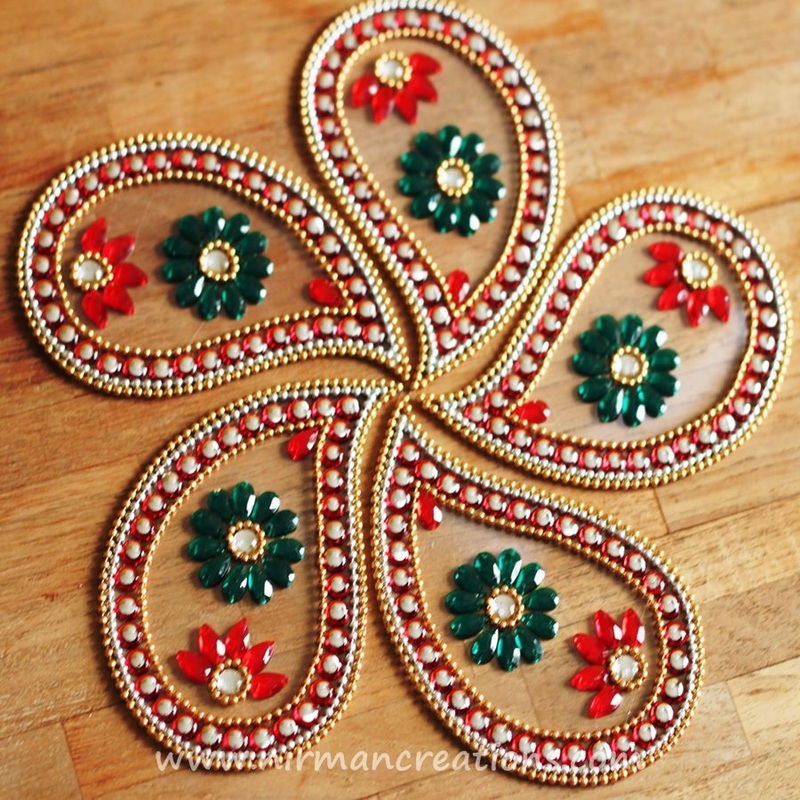 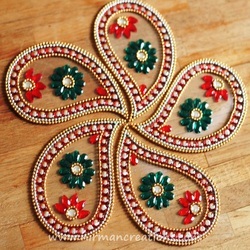 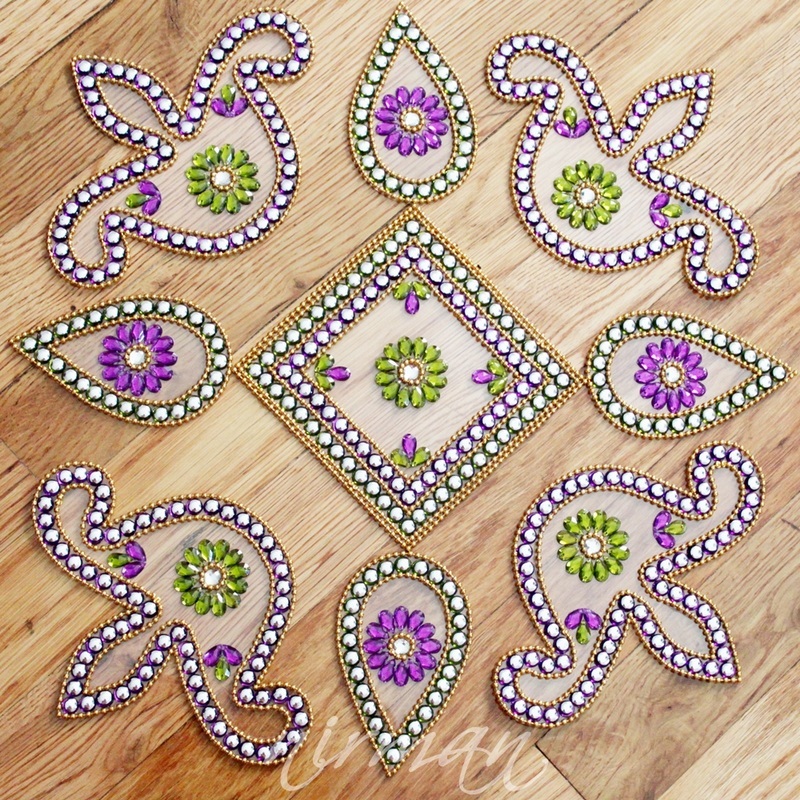 At Nirman this traditional form of art of Rangoli is created with some extra bling. 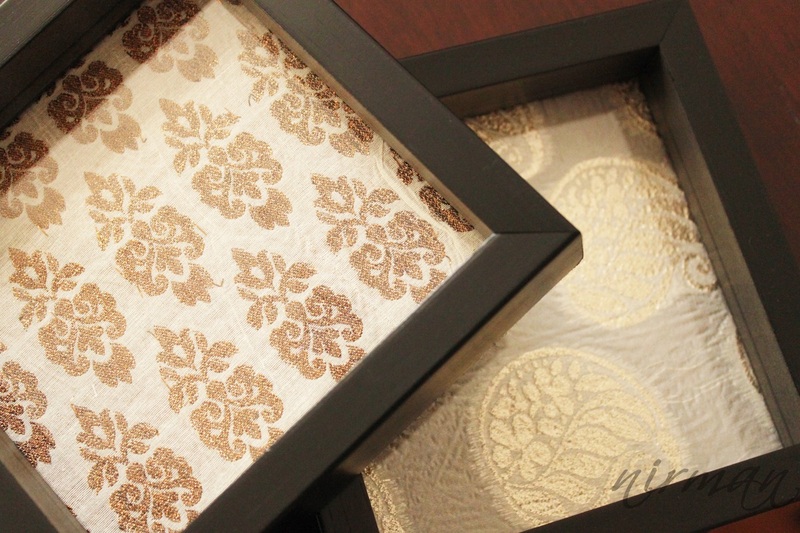 We are truly inspired by the paisley pattern all around us. 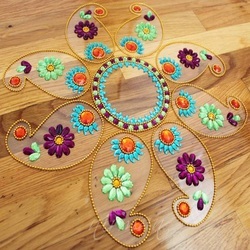 These pieces are created on clear material with beads & colored crystals which can be placed on any kind of surface. You can change these designs, just like your powdered color Rangoli, minus cleaning time. 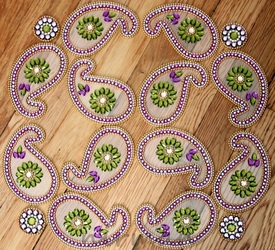 This can be re-used for years to come. 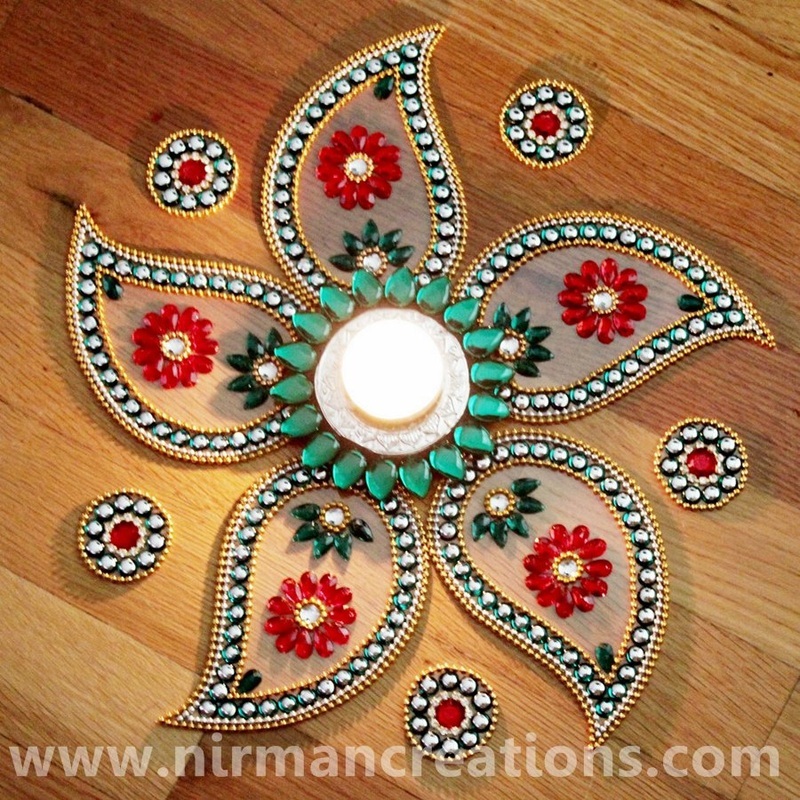 Tea light candle holders have been handmade to be able to float in the water. 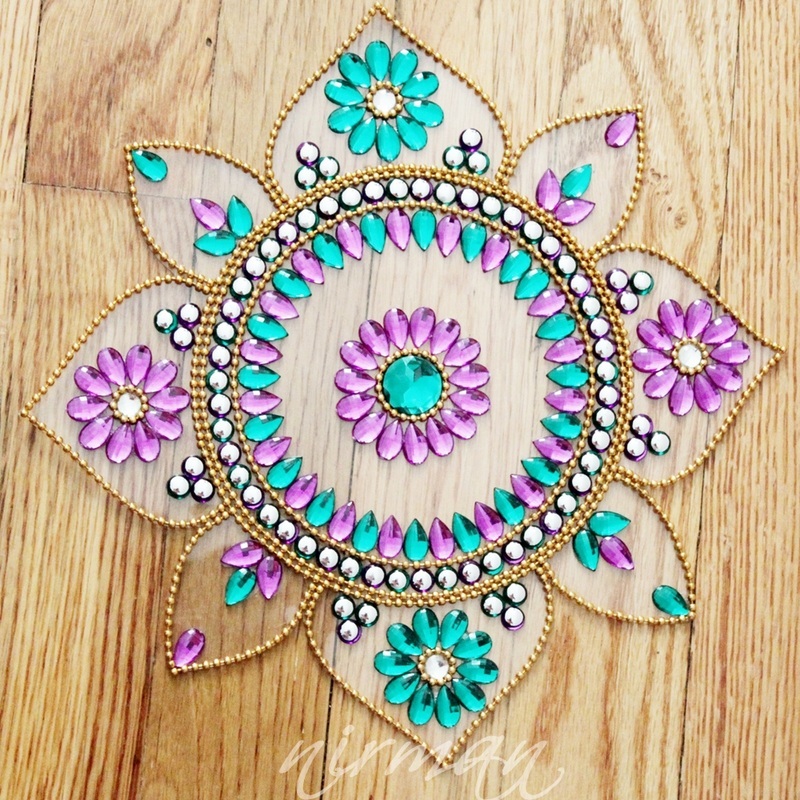 The lotus design is inspired by the Indian national flower- Lotus.They look beautiful by themselves or in a group floating in water. 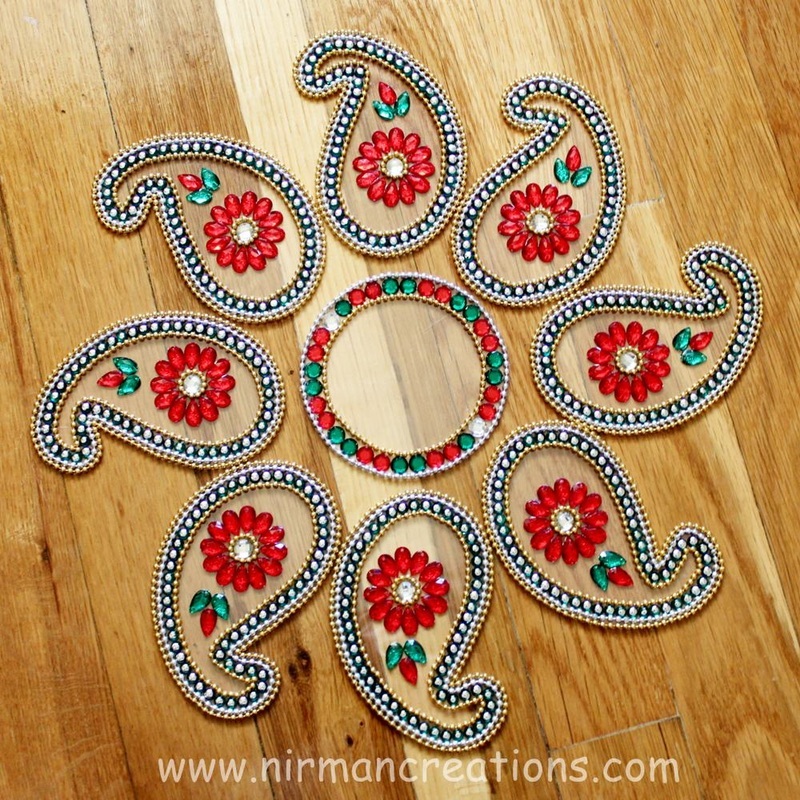 They make great accent pieces for holidays, center piece decoration or in Rangoli, around your bathtub for a relaxing bath, center pieces for weddings, bridal showers and the list goes on. 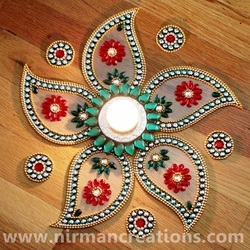 They look great in pooja rooms (Indian prayer rooms) and make attractive floating diyas (Indian tea light candles). 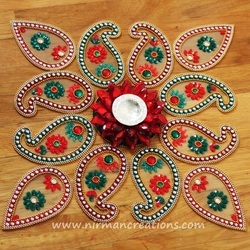 These are made with a silver center piece which would hold the tea light candle siting on the floating material. 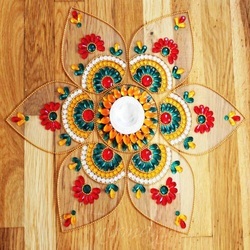 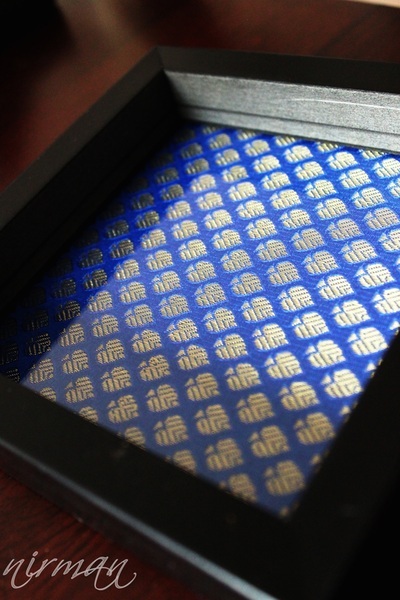 It is then surrounded with clear colored crystals (kundans) in layers to form a small lotus. 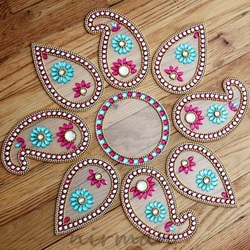 These incense holders have been handcrafted to float in the water or kept on a flat surface with or without an incense. 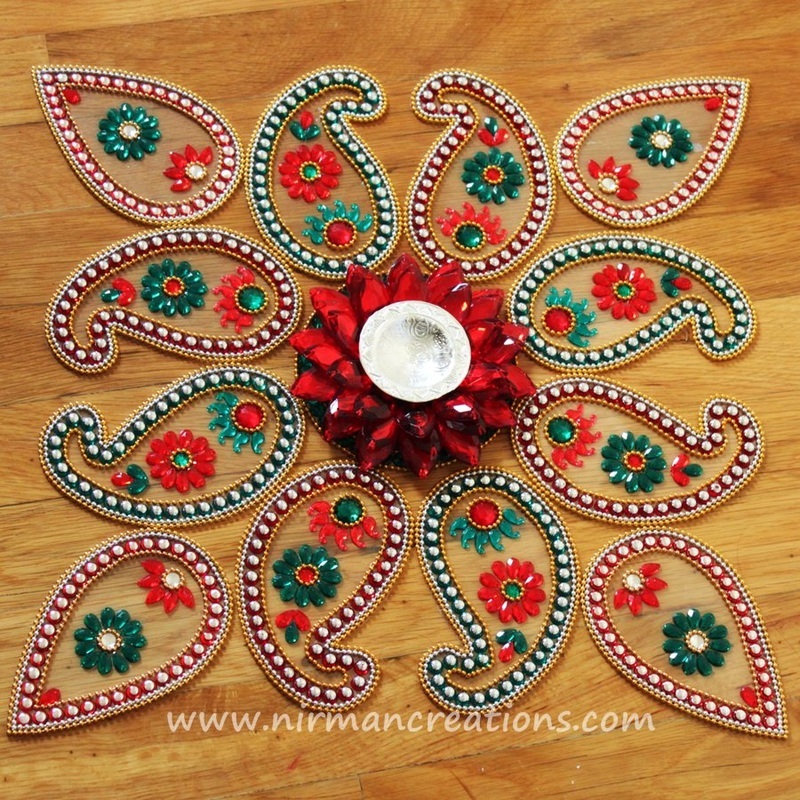 These floating flowers can be used along with the tea light candle holders in a water body or be arranged around Rangoli designs or be just used as table decor. 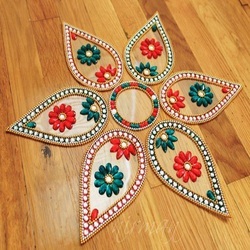 They will add to all the glam to your decor. 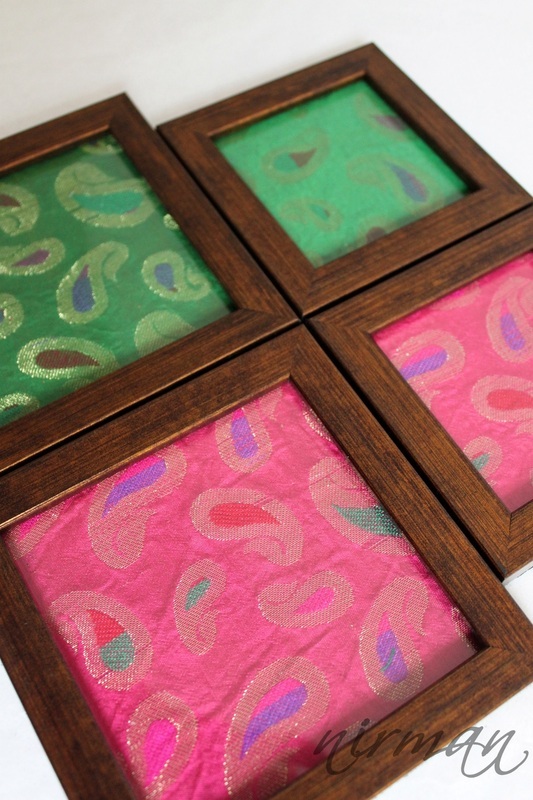 Subscribe to our newsletter to be the first to know of our new designs!